A project management to provide services other than usual for installation and maintenance. Automation of controls at frontiers enhances security and eliminates queuing. 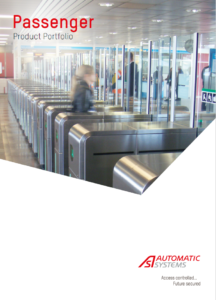 Automatic Systems proposes products which are ready for the integration of biometric and electronic passport readers: SmartLane ABC single gate or SNG double gates, equipped with the ASDAS one-person-only detection system. Automatic Systems proposes automatic boarding gates (SpeedBoarding, QBG/SBG), gates for secured access to restricted zones (SmartLane SECAP) and anti-reflow doors (PAS).